Modeling Geum radiatum was very challenging compared to modeling I’ve done before because we know the species specializes on small habitats with microclimates. And these particular microhabitats are are not well reflected by the coarse-scale climate data that is available. I used ClimateNA for the basic climate layers. ClimateNA purports to be “scale free” but actually isn’t (and its creators acknowledge this). Indeed, I found that the relative humidity measured by Eric’s team was far higher than the values predicted by ClimateNA for the same years and locations. Ergo, ClimateNA (and other similar climate data sets) cannot really reflect microclimate on the order of of 100s of meters or less. So how can one capture microclimate when one doesn’t have microclimate rasters? One option is to use microtopography, fine-scale measures of slope and aspect that hopefully help create microclimatic conditions relevant to the species. This gives us the “topoclimate” of Guitiérrez Illán et al. (2010). So, I coupled fine-scale topography data at 90-meter resolution with climate data from ClimateNA at 1-km resolution. Now the normal way to combine data sets of differing resolutions would be to resample the coarser-scaled rasters so they have the same resolution as the fine-scaled rasters. But I felt this would create an illusion of precision in how well we know climate at fine scales. So instead I wrote an R script to extract values from each data set in its native resolution and fed that to the predict() function. Essentially, the script goes cell-by-cell across the fine-scaled topography raster stack and extracts the matching coarse-scaled data from the climate raster stack. Then it writes a fine-scaled prediction raster from the ENM. The output doesn’t look especially blocky when you see it in the publication (Ulrey et al. 2016), but if you look carefully at the zoom-ins you can indeed see the effect of matching coarse- and fine-scaled data sets. 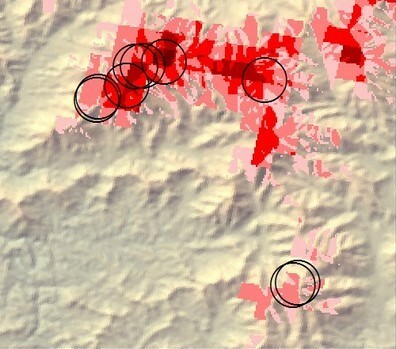 The larger reddish cells reflect appropriate macroclimatic conditions (i.e., at 1000-m scales), while the smaller dark red areas indicate appropriate macro- and topoclimatic conditions. I admit the map isn’t visually pleasing–it’s obviously an artifact that the predictions are blocky. But by keeping the data sets at their native resolution I believe the output better reflects the limit of our knowledge about the predictors, and in turn, the geographic realization of Geum‘s microclimatic niche.